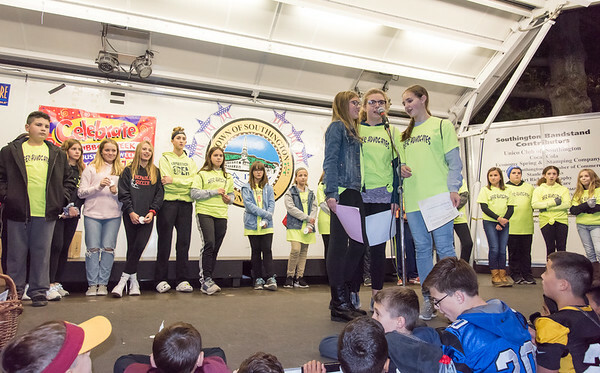 SOUTHINGTON - Town leaders and students gathered on the Town Green Tuesday for the annual Red Ribbon Rally, with students vowing to stay drug- and alcohol-free. As the event began, students from peer advocacy groups passed out candles to be lit later. The children would also sign the red ribbon as they made their pledges to themselves and their loved ones. The Red Ribbon Rally was established by parents nationwide in response to the murder of a Drug Enforcement Administration agent, Enrique Camarena, in 1985. Its purpose is to show that drugs can kill and to encourage participation in drug-free activities. Community groups and leaders took the stage to offer words of advice, encouragement and warning. 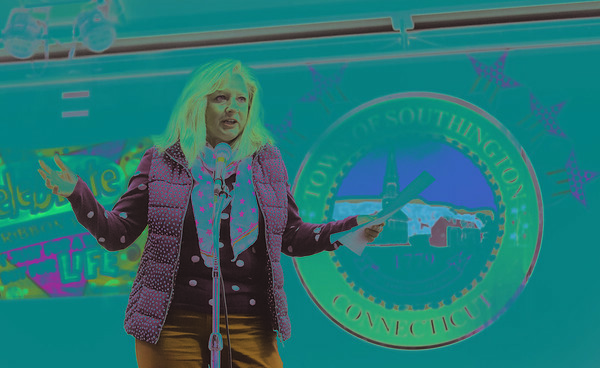 Trish Keneflick, who heads the Southington Drug Task Force, encouraged attendees to cheer for themselves, their police and fire departments and Police Explorers, whom she invited to speak. “The more you use, the more you lose. Don’t do drugs,” the Police Explorers recited in unison. Keneflick then Town Councilor Victoria Triano. “When you say you were not going to do drugs you can’t just say it,” he said. Brian Goralski, chairman of the Board of Education, urged children not to lie in front of their parents and their community. “One mistake, one bad choice can have terrible consequences,” he said. Goralski then introduced Christine Gagnon, a resident whose son was caught with marijuana in high school. He was expelled and kicked off the football team. He later went on to heroin and other harder drugs, and was in and out of rehabilitation centers and mental hospitals. Fifteen months ago, he died in his sleep with Fentanyl in his system, leaving behind a daughter. Posted in New Britain Herald, Southington Herald on Wednesday, 17 October 2018 21:04. Updated: Wednesday, 17 October 2018 21:06.